2019 Camps- Easter, Mid-term and July! Yoga, Mindfulness & Movement Camps for kids, tween and teenagers. – Sheila Wayman, Irish Times Article in the Family and Health Supplement, September 2017. Mental health is now a priority within school environments. This program tailors to children’s interest, attention span and their natural aptitude for meditation! They experience the benefits of healthy personal awareness, positive self-regard and confidence to express themselves. Authentic expression, emotional intelligence, body awareness and self-confidence within children and young adults through yoga, meditation, theatre games, dance and life coaching techniques to support their ambitions and mental wellbeing. Register your details and child’s information and pay online for the camp via this link: click here!!! Under Kids events you will see the two camp age groups. 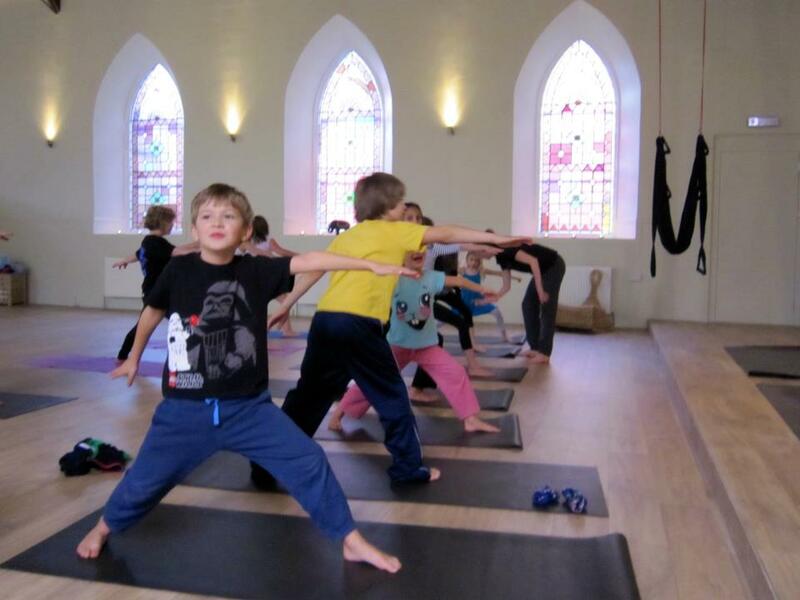 Healing Yoga is partnering with Auriel Yoga to bring kids the best fun, learning and experience through yoga, dance and art. As a Life Coach, Holistic Therapist, Yoga Teacher and Dance Artist- Laura combines many elements to make a well-rounded holistic experience that considers each student’s physical, mental and emotional wellbeing. Laura has taught children classical ballet, movement improvisation and yoga in performing arts schools in Dublin, primary schools in Berlin and yoga centres in Scotland. She has a high sensitivity to their needs and a hugely creative interest in encouraging and strengthening their intuitive talents and interests. Laura has trained in ballet, contemporary dance, speech and drama, yoga, reiki, life coaching, tension stress and trauma relief, creative practices, child protection and first aid. In Dublin, Laura teaches in schools to students from preschool to primary to secondary school students. Read more about Laura’s Background. Laura is a unique teacher and therapist. She is whole-heartedly devoted to what she does and to all the individuals she is teaching or treating. Her yoga classes helped me to better understand my body, to realize what was going on inside me and notice things that needed more attention. Her classes helped me to relax and lift my energy levels. I also received reiki from Laura; it was such a powerful experience and I would recommend it to anyone. I am thankful that I got introduced to the world of yoga, reiki and meditation by this special person. I am in awe of your healing concepts! So happy to have found your class and am so excited to learn so much from you each week about somatic movement and healing exercises woven into yogic practices for my personal healing path. I have already gained so much from the classes to help me on my personal journey, thank you! I have tried many different treatments and classes, but none have made me feel so welcome and valued. Laura understands each client so well, the improvements I've made in my lifestyle since I started yoga/reiki with Laura has been amazing. She is good for your soul. Tears and Fears: The benefits of a sad movie!